However, I’ve been pleasantly surprised with it and the install time event took less than an hour. The camera works great both in the day and during the night time. The speaker comes across loud and clear. The only downside right now is there is no API for the device. I was in the market for an outdoor camera and this looks like it meets the majority of my needs. The only downside so far is the rechargeable battery, but it has a pretty long charge time (6-12 months) so you only have to fetch it once or twice a year to charge. Anyways, I highly recommend the Ring doorbell for anyone that is looking for a home improvement upgrade. Overall, an amazing relay race, super well organized and highly recommended! I will definitely take a look at the other Ragnar relays out there. I finished in 02:58:58 with the first two 10K laps taking about 54 minutes each and the final painful lap taking about 70 minutes. I ended up fighting some stomach issues in the last few miles and just couldn’t keep my pace in check (hey it happens). In the series, I finished 10th overall with a cumulative time of 08:26:23 which I’m happy with, definitely not my best but I’m getting back in the swing of things. 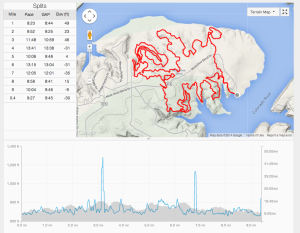 Next up is my favorite trail series of the year… Capt’n Karls! Nothing more fun than running races in the dark with your headlamp, who doesn’t love 7pm start times? Here’s a secret for those of you who travel a lot like me for business. Some airlines have fantastic customer service via Twitter Direct Messages (DMs), even better than using the phone for most issues in my experience! Over the past several months, @AmericanAir has been a pleasure to work with over Twitter DMs for when travel issues unfortunately happened. I’ve shared this little secret with friends and they had similar success with other airlines like @VirginAmerica and @Jetblue, especially when phone wait times were atrocious. Also, I’m definitely not the only one who has noticed this. In the end, I hope more airlines and businesses follow this customer service model, or at least offer it as an option. For most issues, it’s usually simpler to deal with things over direct message (text) than having to interact with someone over the phone, especially when you’re on the go. I even see a future where you can even automate most of these interactions so you may not need a human being for a good portion of customer service requests. Anyways, happy and safe travels! Besides getting rained on a couple times, it was a beautiful run in the hill country. It was my first time at Flat Creek Crossing Ranch and I enjoyed the wide open terrain and even a cave on the course. Time wise, I ended up finishing in about 2:43 which isn’t fantastic but I’ll take it given the course was challenging and new to me. I’ll be better equipped next year. Anyways, next up is the last race of the series, Reveille Peak! I had a great time at @Flight, our first mobile developer conference at Twitter where we announced Fabric. As part of the conference, I helped organized a small run in the morning to start things off, it was nice to see about 20 people show up to run a 5K (ok, it was really more like an 8K with hills). At the conference, I had the opportunity to talk briefly in the Lightning Theater about some of the open source technology behind tweets, in the context of what happens behind the scenes of a typical API call. I hope the audience left with some new knowledge and appreciation of what helps power those tweets they see everyday. I posted the slides on Slideshare if anyone is interested. I look forward to us doing this next year, it’s about time that we do more developer focused events at Twitter. I finished third in my age group and 6th overall with a 6:35/mi clip! Suffice to say the second loop was a lot more painful for me. I finished a bit over three hours which is OK but I was really shooting for a negative split to get me under 3 hours for the race.